Single family residence, makes an excellent investment. Features 2 bedrooms, 1 bathroom, living room, kitchen and laundry room. Parking for over 4+ cars, private and fully fenced with a large front yard. 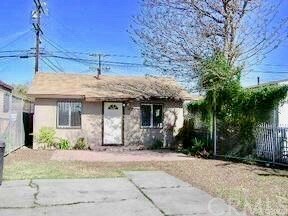 Property is perfect for owner to live in or investors to build a duplex on this same size lot, Buyers to verify with city.